Creative students at Middlesex have the unique opportunity to intern at redLoop, the University's interdisciplinary design and innovation agency. It is well known that making the jump from student to professional can be a tough transition, and gaining relevant experience in the real world is essential if you're going to convince employers you have what it takes. That is why at Middlesex University we're proud to be able to offer our students internships at redLoop, a research-led, innovation and design collaboration centre run by the School of Science and Technology. Students from a range of science and technology or art and design degree courses can apply for the 'sandwich year' internships, joining redLoop in their third year before returning to university to complete their degree in the fourth. "Our interns work on a range of commercial projects, for both internal clients within the University as well as external clients, and all of the students get to work on a pretty wide range of projects," explains Andy Bardill, Director of redLoop. "Most of it is related to research-led innovation or innovation-led research, so they're getting into some pretty high-level stuff and gradually get to take on more and more responsibility for the projects they're working on. 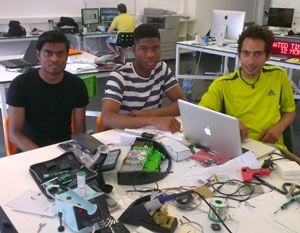 They come here as students and leave as competent junior designers, developers and engineers." Product Design and Design Engineering students are the most common interns at redLoop, alongside those studying Computer Science and Graphic Design, but the centre is happy to talk to students from all across the University to see how they could get involved. The centre has capacity for ten or 12 interns each year, with the majority joining for a full academic year before leaving for the summer holidays in July. A number of interns join on a short-term basis for around two months, but the ethos of redLoop is to have interns stay for six months to a year so that they can become valued members of the team. This also means that the proposals redLoop are putting forward and the work they're doing can be tailored around the interns' skills and the ambitions they have for their placement. Interns at redLoop this year had the opportunity to work on a number of challenging briefs, from physical products to mobile apps, websites to physical computing projects. A number of the students also worked on the RAF Dornier project featured in the video above. "When I finished my second year I knew that I wasn't ready to begin my final year yet," says Jonathan Joanes, a BSc Product Design student who has just completed his redLoop internship. "RedLoop provided a platform where I could develop my skills, and I feel like my design work has come on a long way from where it was before I joined. You quickly learn that design in a work environment is completely different to design in an educational environment. "I would recommend any student interested in design, programming or any of the things we do at redLoop to look at the internships. It's a great environment to be in and a good platform to bounce off."